You are currently browsing articles tagged Big Brook. Ruth Dwyer was married long and happily to my father‘s cousin Jack Dwyer. 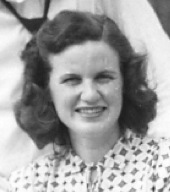 Even though she was Pop’s cousin-in-law, we still called her Aunt Ruth. Jack was Uncle Jack too, as was his father, who was married to my grandma Searls’ sister Florence. I pulled this picture of Ruth from this family shot here. She’s in this one too. (So are both Uncle Jacks. The younger is on the far right, shot before he grew his signature handlebar mustache). I’m sure I have a few shots from a family gathering a few years ago at Big Brook, my Aunt Grace’s place in New Jersey. Ruth died two days ago, surrounded by her family, at age 85. (More details in her obituary.) I haven’t seen her, or any of her kids (my second cousins) much since the years I was growing up in New Jersey. Looking at these pictures, and remembering the good times, I regret the distance that grows as families fan out acrosss time and generations. (Ruth and Jack had six kids and ten grandkids.) I’m also glad that we’ve at least been able to catch up and hang out with Aunt Grace (now in Maine and going strong at 96) and other East Coast Searls-side family, since coming to live (at least during the school year) in Boston. Tom Brokaw called Ruth and Jack’s “The Greatest Generation”. It might be a stretch to lay that label on any generation, but I agree with it. And now most of them are gone. My generation — boomers the Greatest produced in abundance — are aging to become the next round of geezers walking the plank of life. Life is short. That’s why it’s important to pause in the midst to remember those who live it well.